Toulon's owner has reminded former All Blacks Ma'a Nonu and Tom Taylor that he won't accept any drop in standards at the leading French club while dishing out a nasty insult to Quade Cooper. 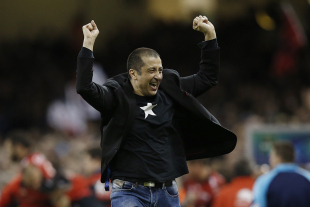 Unimpressed by the European champions' progress this season, billionaire Frenchman Mourad Boudjellal dished out criticism to some of his high-profile southern hemisphere signings in a rugby magazine interview. Decorated midfield back Nonu and three-Test utility back Taylor are both in the early stages of their contracts but weren't spared by Boudjellal. He described some of Nonu's performances as "disappointing" to Quinze Mondial. "I can't tell you that I don't have concerns when I see the performances of Ma'a Nonu." Taylor's mixed goalkicking returns didn't impress the owner either. "I have the impression that Tom Taylor, an All Black, trembles each time he has a penalty attempt." Toulon have lost five of their 12 games in the French Top 14 championship to be fourth. They are placed second in their pool in the European Champions Cup in a modest start to their pursuit of a third-successive crown. "Right now if I say that I'm not happy with our stars, it's only because we expect a lot," Boudjellal said. "It's true that in our imagination, we want them to fly across the pitch." The harshest words were reserved for Wallabies playmaker Cooper, who has the unenviable task of replacing English great Jonny Wilkinson at first five-eighth. "It's difficult to go from foie gras to pate," he said. "For now, Cooper is not what I was hoping for. But we have to also give him time."